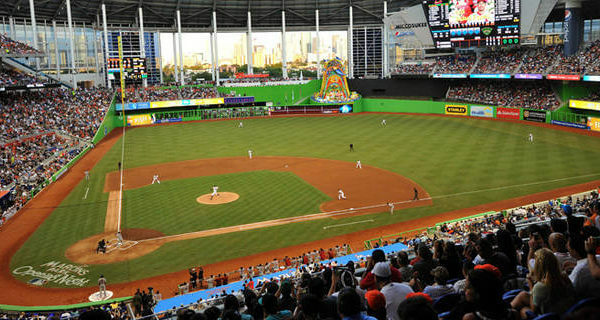 In 2012, they moved into newly constructed Marlins Park in Miami’s Little Havana. Marlins Park is a baseball park located in Miami, Florida. It is the current home of the Miami Marlins, the city’s Major League Baseball franchise. It is located on 17 acres of the former Miami Orange Bowl site in Little Havana, about 2 miles (3 km) west of Downtown. Construction was completed in March 2012, in time for the 2012 season. The stadium is designed in a neomodern form of baseball architecture. Marlins Park was also LEED certified as the greenest MLB park in 2012. The building is the sixth MLB stadium to have a retractable roof. With a seating capacity of 37,442, it is the third-smallest stadium in Major League Baseball by official capacity, and the smallest by actual capacity. The Miami Marlins are an American professional baseball team based in Miami, Florida. The Marlins compete in Major League Baseball (MLB) as a member club of the National League (NL) East division. Their home park is Marlins Park. Though one of only two MLB franchises to have never won a division title (the other is the Colorado Rockies), the Marlins have won two World Series championships as a wild card team. Marlins – The old nickname was revived from back in the 1950’s from the International League and Florida State League called the “Marlin,” a popular sporting fish. However, the team officially adopted the Miami Marlins name on November 11, 2011. This was part of a funding agreement between the team and the city of Miami for the team’s new stadium set to open in 2012.
Who is the greatest Miami Marlins? The Miami Marlins are an American professional baseball team based in Miami, Florida.